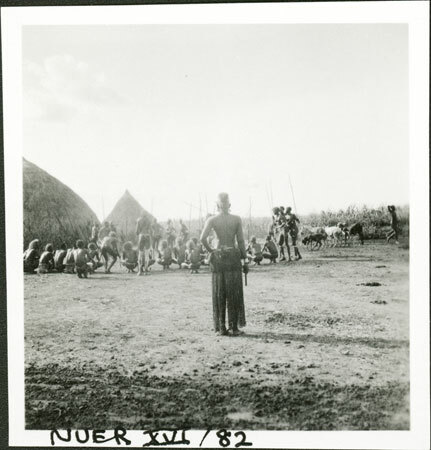 A group of men crouch in a line around a master of ceremonies in the courtyard of a homestead at the beginning of a dance. A married woman wearing a long fringe leather skirt stands in the foreground watching them. The dancers are Lou men of Yakwach camp which Evans-Pritchard revisited in 1935. Note on print reverse ms pencil - "64 3 A149" & print front border ms ink - "NUER XVI/82"
Morton, Chris. "A Nuer dance" Southern Sudan Project (in development). 03 Jan. 2006. Pitt Rivers Museum. <http://southernsudan.prm.ox.ac.uk/details/1998.355.793.2/>.